When you need appliance repair or installation, you want a name you can trust. It Is Fixed Appliance Repair is the best, most reliable and affordable appliance repair service in Atlanta. You can count on us to be there when you need help, even in the middle of Midtown rush hour. We know it’s frustrating when your appliance breaks, so we want to make getting your machine back up and running as easy as possible. The first step is to contact us to request service. You can call directly at (404) 407-0071 or request a service call online. Whether you call or send a message, you will always be connected directly to a human. We don’t believe using automated systems is the best way to provide personable, friendly service to our customers. When you’re ready to book a diagnostic service, we will do everything we can to get a technician out to you quickly, at a time that works for you. If you work during the day, you don’t have to miss hours at the office to make an appointment. Our technicians are in the field until 7:00 P.M. Monday – Sunday. Many of our competitors charge extra for “emergency” after hours service. It Is Fixed believes that it’s an emergency any time you’re forced to manage without a necessary appliance. That’s why we offer same day appointments, and never charge extra for weekend or after hours appointments. We’re happy to have your service whether it’s at 6:30 P.M. on a Tuesday or 10:00 A.M. on a Sunday. Other appliance repair companies may make you wait 4-8 hours in a service window. Not It Is Fixed. Our service windows are only two hours long. When our appliance repair specialist is on the way to your home, you will receive a notification so you can be available when the technician arrives. At your appointment, the It Is Fixed Appliance Repair specialist will thoroughly review your appliance and give you a quote for service. If you do not choose to complete a repair with us, the service fee is only $39.95. We waive the service fee if you complete a repair or installation. The washing machine automatic door lock is not releasing and is holding your clothes hostage, what do you do? As important as this safety feature is, it is very frustrating when you need to get your clothes out. 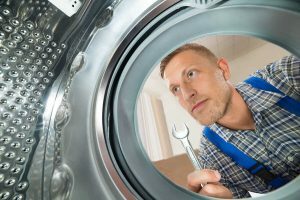 Find out how to fix the most common causes of this dilemma in our troubleshooting guide for washing machines. Cooking with gas has many advantages over an electric or glass cook top but it also comes with some hazards such as the increased risk of fire and potential health complications from a gas leak. If you smell gas and no one is cooking, check out our troubleshooting guide and see if it’s a quick fix or if you need to call a technician. You flip the switch but the oven light won’t turn off. It stays on as if it’s little light bulb life depended on it but when your oven light doesn’t turn off, it goes from friend to energy-wasting nuisance. 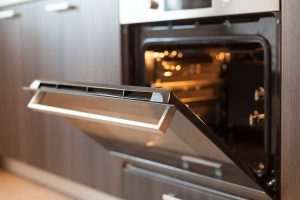 Find out why it might not be turning off with this oven troubleshooting guide from It Is Fixed Appliance Repair. Jacob from It is Fixed just left my home – 7:37pm on a Monday. He found the problem with the leaking refrigerator, was able to fix it without needing new parts. Explained the problem, the how and why of the fix and even gave a teacher’s discount to boot. I was so happy with the service and price that I requested he do the whole refrigerator service and coil cleaning. He did so without hesitation and was genuinely grateful for the extra business. He even called 1/2 hour before his arrival time, which was well within the appointed time– which they said they would. I called this morning, and they were able to come out same day…unheard of! I would recommend IT is FIXED to anyone needing appliance repair. Great service! I was updated several times to arrival of the service technician because he thought he might be late. He talked me through what he was going to do before he did it and then told me the estimated costs up front. When he finished, he again explained what he did and why and then gave me some helpful tips on how to keep my washer in the best condition possible. Mario was excellent and very conscientious. I am grateful to have found you all! Mario Armas went out of his way to get my dryer repaired in a timely manner. He had to come late in the day to accommodate my needs, and this was greatly appreciated. The service was impeccable, and everything was cleaned up and returned to the original condition before he left. Wonderful!! !